If you receive this Bulletin direct from the British Marine Life Study Society it will contain only *.htm *.gif & *.jpg files. at a resolution of 800 x 600. Viewing should be possible on Netscape and other browsers. The Glaucus 2001 CD-ROM has been sent out to Premier Members for last year. This information packed disc contains the British Marine Life Study Society web pages and other wildlife information (some not available through the web site). This was a limited distribution copy because of technical difficulties and the the next CD-ROM to be produced will be the Glaucus 2002 CD-ROM. New 2002 members subscribing for the CD-ROM will receive the beta version until the tested copy is available. A pod of twenty Common Dolphins, Delphinus delphis, and three Porpoises, Phocoena phocoena, were spotted by Paul Semmens off Kenidjack, Cornwall (SW 3632). 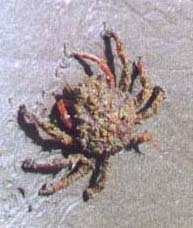 A Spiny Spider Crab, Maja squinado, aggregation at St. Agnes, Cornwall was seen by friends when snorkelling. And a Spiny Spider Crab aggregation seen by myself at Seatown, Dorset. Interestingly they seem to be at the same spot I last saw them ten years ago i.e. straight out from the car park on the line between the sand and the shingle slope. Most had recently moulted and were all roughly the same size. Their numbers ran into the thousands. Why they congregate here I don't know. Just 250 metres down the beach to the west there were none. A badly decomposed Cuvier's Beaked Whale, Ziphius cavirostris, was washed up on Gwynver Beach, Whitsand Bay, Cornwall (SW 362275). It was about 5 metres long. Three Leatherback Turtles, Dermochelys coriacea, were found on three separate Cornish beaches alive at Millook Haven, 6 km south of Bude on the north coast, and Perran Sands (SW 7655), with a dead specimen washed up at on the strandline of Watergate Bay, Cornwall. The Marine Conservation Society have produced a laminated Turtle Advice Sheet (endorsed by DEFRA). The guide contains reports numbers and advice. Public Exhibition of the Lancing rocky Sea Defence Plan on the seaward side of Widewater Lagoon, Lancing, West Sussex. The most controversial proposal seems to the the inclusion of a seawater pipeline. Live small cockles (new recruits of a breeding population) have now been discovered at depths of 20 cm in Widewater, which was about a metre deep near the bridge. This is the Lagoon Cockle, Cerastoderma glaucum, although when the cockles are small (12 mm width) they do not have the shape of the full grown ones, so they initially looked to me like Common Cockles, Cerastoderma edule. Actually, whilst they are alive there does not seem to be an easy way to distinguish them as it is the interior groove differences that are diagnostic. 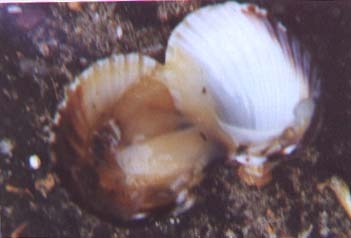 The shell is thinner and the Lagoon Cockle is brittler and the live shell can be easily prised open with a fingernail which is much harder with the Common Cockle, even small ones. The Shore Crab, Carcinus maenas, would find these shells very easy to crack open. The black ooze (mud substrate) also revealed Nereis (ragworms), lugworms and other assorted worms. The tiny gastropod Hydrobia was plentiful as expected. There were also a few sediment-dwelling attachment type sea anemones discovered, although these were not Edwardsia ivelli. At the time of writing, they have not been identified. A very badly decomposed and smelly Sperm Whale, Physeter catodon, is washed up at the beach at historic Hopetoun House near South Queensferry on the Firth of Forth, east Scotland. The 10 metre long whale is estimated to weigh about 8 tonnes, and this posed a massive environmental disposal problem. The beach was closed because of the horrid smell. A pod of nine Killer Whales, Orcinus orca, were seen off Noss (east of Lerwick) in the Shetland Islands early in the morning, heading south. They were later seen off Fladabister (5 miles south of Noss on Mainland) at about 5:30 pm. On 12 July 2002, a pod of eight were seen off Sandwick, (a further five miles south of Fladabister) and again off Sumburgh at the extreme south of Shetlands. This may be the same pod? 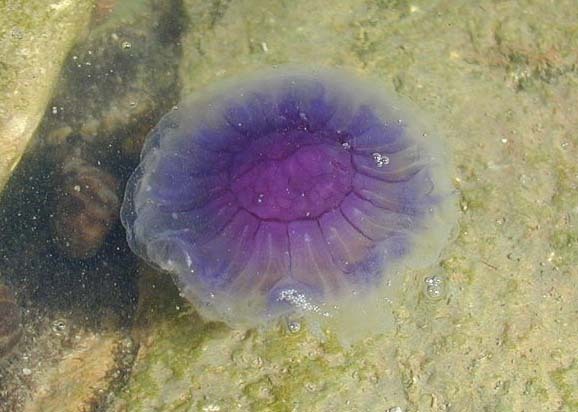 A jellyfish was discovered alive in a rockpool on Worm's Head, the "wurm"-shaped rock island connected at low tide by a causeway to the western end of the Gower peninsular at the southern end of Rhossili Bay in south Wales. The jellyfish has been identified as the Blue Jellyfish, Cyanea lamarckii. Inverted the jellyfish was white underneath. It quickly righted itself. Amongst the mixed rocks, another much larger jellyfish was also washed up dead. The Phocine Distemper Virus has been identified as the cause of a new increased total of 461 Common Seals, Phoca vitulina, carcasses tested in Denmark, with a further 150 in Sweden and dead seals also recovered on the shores of the Netherlands. 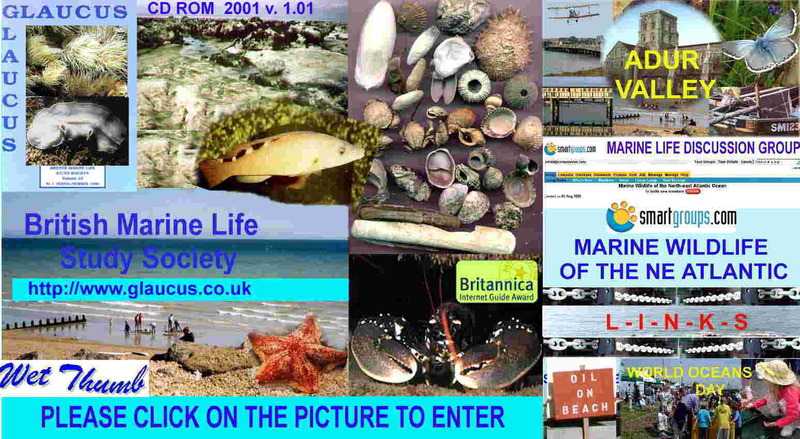 The British Marine Life Study Society web pages are available for permanent reference on the CD-ROM. Sub-directories cannot be accessed directly through this domain. Forum for discussion about the marine life of the North-east Atlantic Ocean, including the North Sea, English Channel and all the seas around the British Isles including Ireland, Iceland, Norway, Sweden, Denmark, Netherlands, Belgium, France, Spain and Portugal. This page can be used by members to report finds, ask questions, queries over identification, concerns about environmental issues etc. This eForum is participated in by members of many groups studying the marine environment. Go to menu bar above and click on Database and then on Marine Life Organisations to find a list of web sites. Photographs and illustrations are best uploaded to the Document Vault and should not exceed 75K in size (*.JPG). Smart Groups was out of operation for one week in June, but it is now working. The Message Archive "Search Messages" facility is promised to be working again during July 2002. Click here for full details of the National Whale and Dolphin Watching Weekend and how you can get involved. The Sea Watch Foundation are inviting you to take part in the UK's first ever National Whale and Dolphin Watch Weekend, aimed at providing a snapshot picture of the numbers and variety of whales, dolphins and porpoises to be seen around the British Isles. 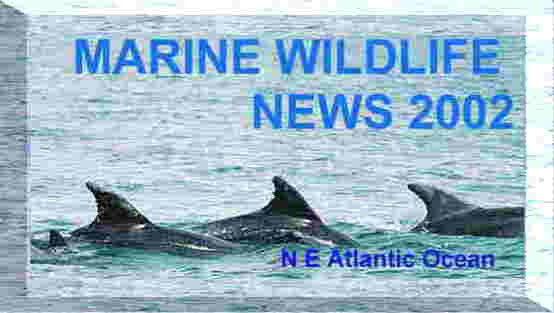 A number of the prime sites will be manned by National Whale and Dolphin Watch co-ordinators. A list of manned sites is available along with contact details for all regional co-ordinators. Alternatively, please click an area of coastline on the map on the web site above for more details about the event in that area. (SAMS) Toxicity of sea lice medicines to non-target marine copepods. 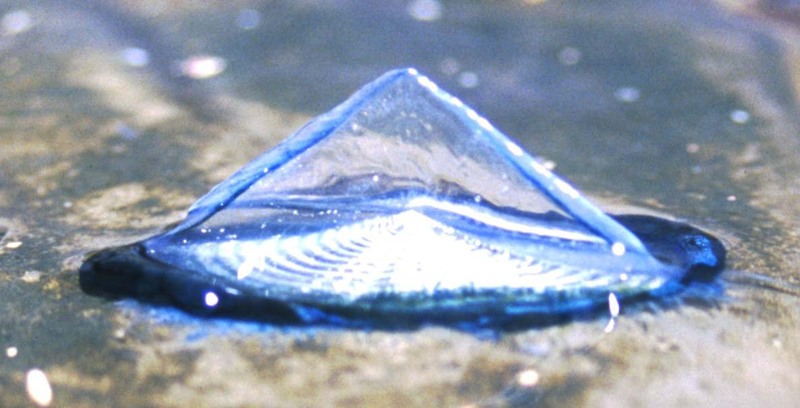 (SAMS) Fish otoliths – a mine of information? Daphne Woods at SOES, Southampton Oceanography Centre, Southampton SO14 3ZH. Stating the DATE, TITLE of the TALK, and NUMBER of tickets required. Entrance to Southampton Oceanography Centre is through Dock Gate 4, please ask for a map if required. Free parking on site, wheelchair access and facilities for those with disabilities. The British Marine Life Study Society Web Site has been included as an Encyclopaedia Britannica Recommended Site and included on the BBC On-line Internet Guide. There are more entries on the GATEWAY pages of the BMLSS Web Site. The logos for the various organisations have been removed to reduce the size of this file. This CD-ROM has not been extensively tested yet. It proves an interesting introduction, but not a comprehensive guide. For the practical method of trying to put a name to an plant or animal you find in the wild, it is not inclusive enough. Available through the Kent Ornithological Society. THE SPECIES DIRECTORY OF THE MARINE FAUNA AND FLORA OF THE BRITISH ISLES AND SURROUNDING SEAS. Ulster Museum & the Marine Conservation Society 1997. The project to collate the species that live in the seas off Britain is an ongoing project. The Directory is a list of all the species grouped systematically according to their scientific names, with a comprehensive bibliography. The 1997 edition, not available until 1998, is the latest list and is useful on the rare occasions (about once a week for me) that I have to look up a vagrant, unusual species that is not listed in the usual identification books. 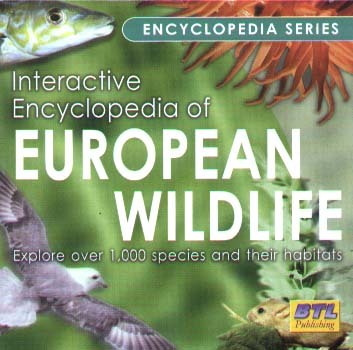 Now available with the CD-ROM, this proves useful list of all the species for professionals, but it could be improved to make it more useful, e.g. facilities for biological recording and an interchange with Recorder 2000. This is a simple project or request to members and readers of this Bulletin. It is to take pictures of the coast when you are next down on the shore. 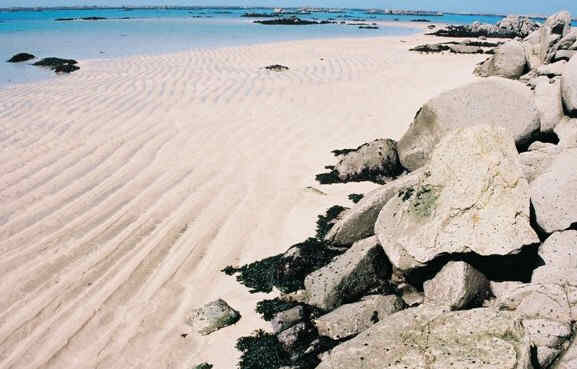 Even general views have value, but ideally we would like photographs of the shore showing the type of rock, topography and rock pools, dominant fauna, and information that cannot be described adequately by words on the Report Cards. The name of the particular coast should be included and the grid reference, if known. Print photographs can be included in Exhibitions and on the BMLSS Web Sites and electronic publications. Electronic images in *.JPG format can also be considered for the web site. They should not exceed 100K in size. These pages are not designed for the default settings on the Page Set-ups of your browser. I recommend viewing in Internet Explorer 5 and altering the right and left hand columns in the Page Set-up menu to 9 mm (from 19 mm). The page set-up can also be amended in Netscape Composer, and this has the advantage of enabling the specified number of pages to be printed and the information about the file (name, path, date) to be deleted. 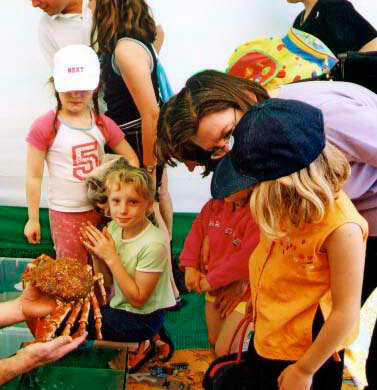 British Marine Life Study Society membership information was sent out with the Shorewatch newsletter in January 2002. If you are unable to view this file with all its images through your EMail software, one way around this is to go to your directory for incoming email, where this file should be stored, and open the file Torped72.html in your favourite browser. Microsoft Internet Explorer 4 and above is recommended. Some of the images may not display if you have changed your directory for downloaded files. The images may also not display properly if your settings on your EMail software do not allow you do this automatically. Unfortunately, I am unable to cater for all the Email software in use nowadays. I am looking into this problem. When received in Pegasus the format is changed slightly, but the bulletin is still readable.